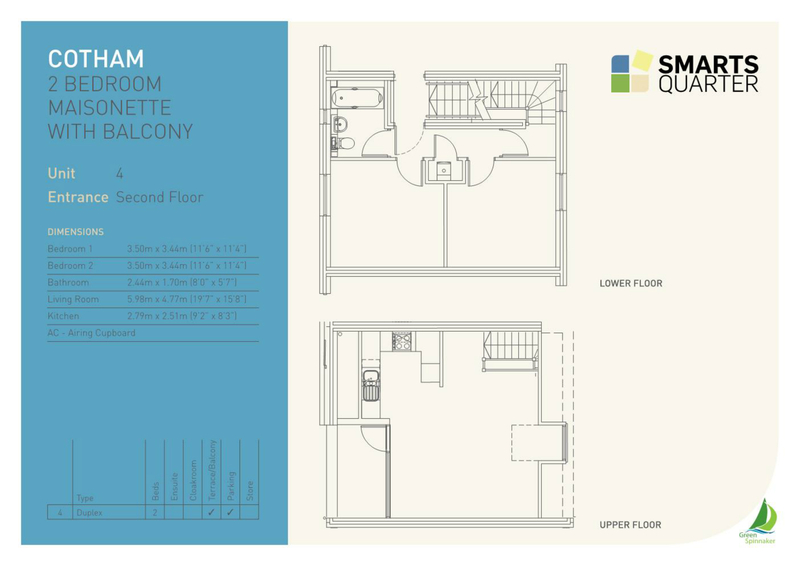 The Cotham is a contemporary 2 bed maisonette located to the south west of the Smarts Quarter development (see site plan) with its entrance on the 2nd floor of the building. The maisonette comprises of an entrance hall on the lower floor from which the 2 bedrooms and bathroom are accessed. Timber stairs lead to the upper floor comprising an open plan lounge/diner with home office space and French doors leading to a secluded outside balcony and kitchen. Secure parking and cycle store for 2 bikes is also provided. Check out the site plan to see where the Cotham Maisonette is located within Smarts Quarter.